In No. 108, Winter 1966, of this Bulletin, the Editor drew attention to the discovery by Mother Thomas More in the Bibliothèque Nationale, Paris, in a fifteenth-century Service Book in manuscript of the original melody upon which Thomas Helmore based the tune of the Advent hymn, ‘O come, O come Emmanuel’ and which first appeared in the second part of The Hymnal Noted, 1854, set to J. M. Neale’s original translation, ‘Draw nigh, Draw nigh, Emmanuel’; but which was altered by the editors of Hymns A & M in 1859 to ‘O come, O come’, etc. Through the courtesy of the National Library, Paris, we reproduce herewith a photographic copy of the complete manuscript of the original melody found in Fonds Latin, MS 10851, folio 89, set to a responsorv for the departed, Bone Jesu, dulcis cunctis. 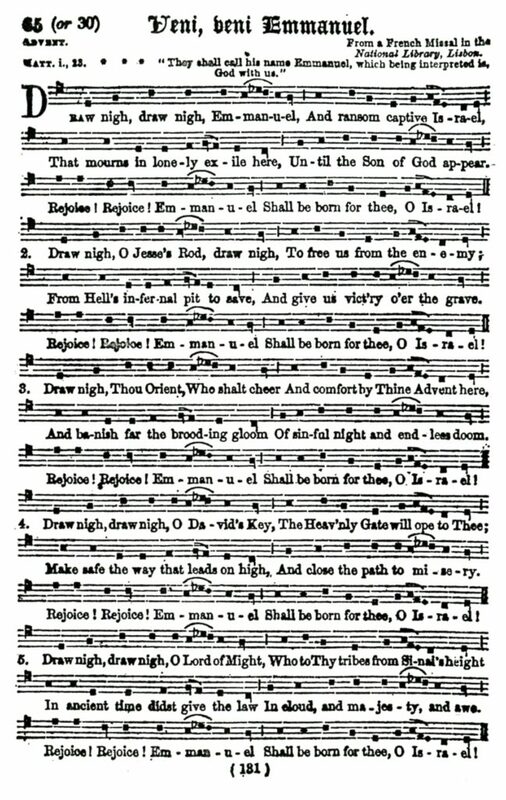 We also reproduce the original Neale-Helmore version of the Advent hymn photographed from the page of The Hymnal Noted, 1854, and taken from the copy of that book which belonged to Helmore. The student will observe that while the melody belonging to the verses of the hymn is substantially the same as that in the manuscript, Helmore seems to have made a considerable adaptation of that part of the melody which is now associated with the refrain, ‘Rejoice, rejoice’, etc. It would be correct therefore to ascribe the melody now in use in our hymnals as: ‘Adapted from a melody in B.N. Paris, Latin MS. 10581 (15th cent.) by T. Helmore in The Hymnal Noted, 1854.’ In The Hymnal Noted the melody is stated to be ‘From a French Missal in the National Library, Lisbon. But for over a century neither that library nor any other library yielded up the source of the tune until Mother Thomas More’s discovery in 1966 in Paris. 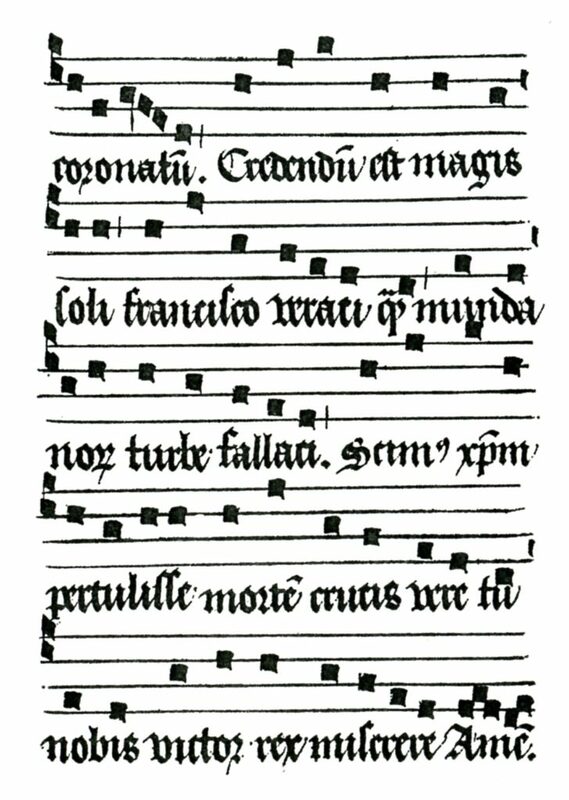 While the original melody is written in plainsong notation in accordance with ecclesiastical convention and law it is not strictly modal plainchant but is cast in the modern minor mode. By the fifteenth century strict adherence to plainsong modality had broken down and there was an increasing use of the modem major and minor modes with the dominant on the fifth note of the scale. 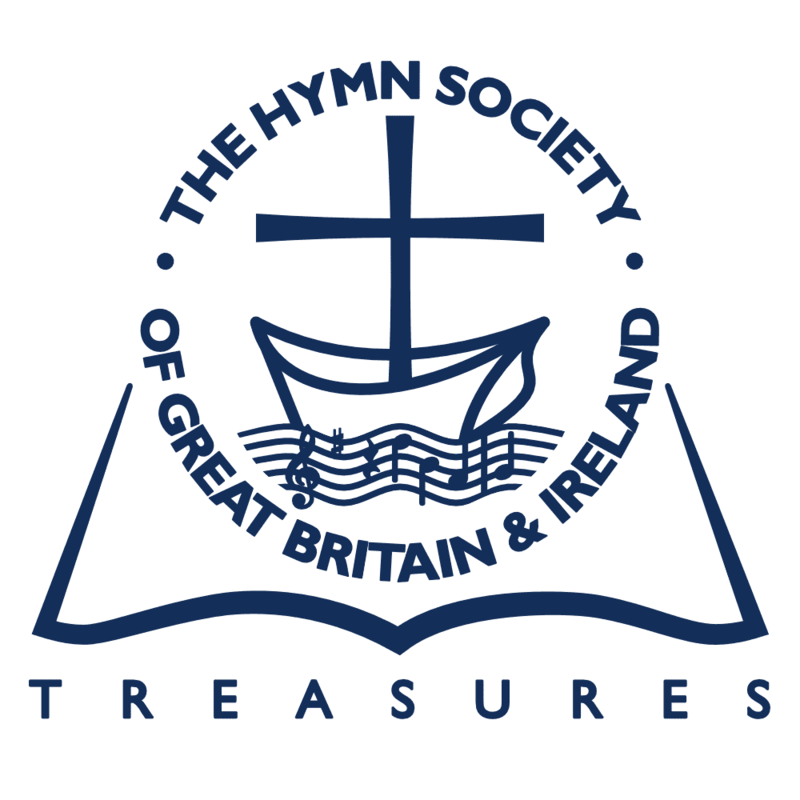 We now pass to a consideration of the source of the words of our hymn. 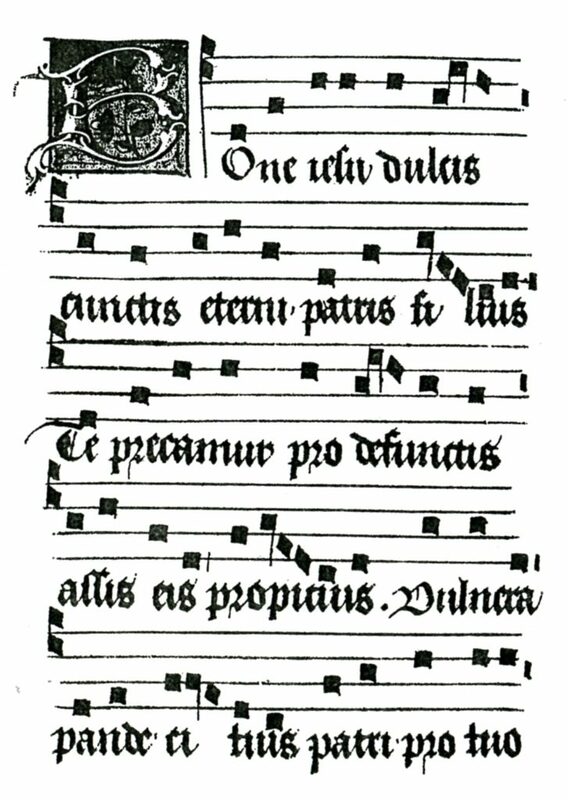 The original source of the text is a series of eight antiphons sung before and after the Magnificat at Vespers in the second part of Advent. The first of these Great O Antiphons is sung on December 16th and every student of the Book of Common Prayer knows this because of the words O Sapiantia that occur in the Church calendar on that day. A complete English version of these antiphons is given in EH 734. But the versification of the hymn does not follow the traditional order of the antiphons which have been in use since at least the ninth century. But instead, the antiphon for December 22nd ‘O Emmanuel’ is taken as the basis of the first verse of the hymn. In this Latin metrical version there are only five verses with the refrain, whereas the original antiphons are eight in number and the first reads: O Sapientia, quae exore Altissimi prodisti attingens a fine usque ad finem, fortiter suaviter que dispones omnia: veni ad docendum nos viam prudentiae. All eight antiphons are based on Messianic references contained in the writings of the Old Testament, which in the Latin text includes the Apocrypha.